Synopsis: Tired of modern day FPS titles not having enough sniper elements to feel a bit more realistic? Sniper: Ghost Warrior is filled that void and my mailbox with a review copy to get all you viewers a hands on review of this newly released FPS that is sure not to break the bank. The story takes place on the island of Isla Trueno after the government is overthrown and a hostile military uprising occurs. 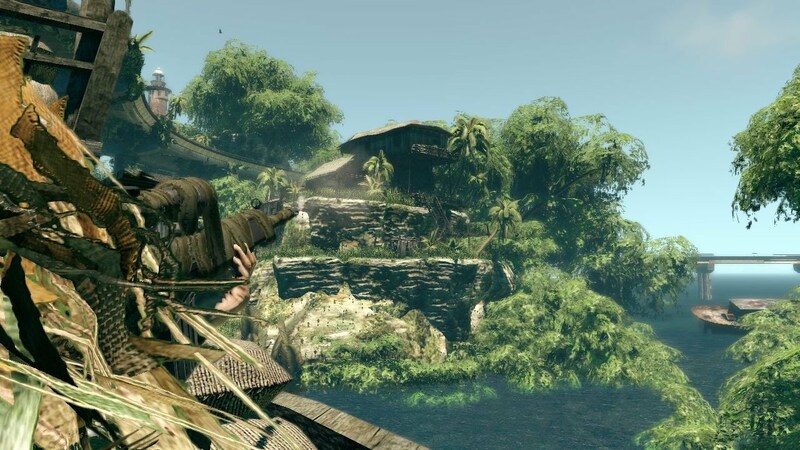 You assume the role of a military sniper, aiding the rebels to put a halt to the oppression and restore the rightful government back to the island. Aside from the story missions, Sniper: Ghost Warrior includes up to 12 person multiplayer modes to see how your sniping skills compare to real people. It’s time to locate the opposition, judge wind and distance, hold your breath, and remember one shot, one kill. 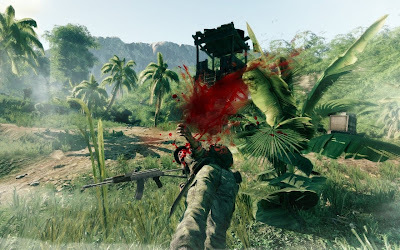 Praise: The first and possibly the most guilty pleasure of this title is the kill cam, which is when you have a headshot lined up and squeeze the trigger, time slows down and you see the bullet make its way to your enemies head and the force of the impact on the body while penetrating said opponent. The sniper elements that you have to take into account when lining up your shots add what feels to be a great amount of realism, having to judge distance, wind, and ultimately having to hold your breath to steady yourself before taking any shots. 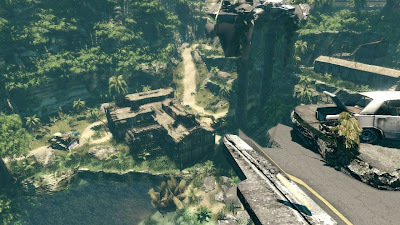 Not being able to complete the mission using run and gun tactics used in previous FPS titles was hard to get used to at first, but it is what makes this game a lot of fun, as you have to slowly make your way to the next waypoint hiding in bushes, slilently killing with throwing knives, and finding higher elevated points to clear the battlefield without detection. Multiplayer was almost as enjoyable as the single player playthrough as you have to choose your spots wisely to find your opponents and take shots without giving away your position. Lastly, another part I particularly liked about the multiplayer was a compass which shows the direction of other players without giving away how far they are so it is a bit of a gamble trying to locate your next kill before they find you. Gripes: The difficulty, even on easy is proven to be rather difficult, my prime example of this is that the enemy AI seems to be a lot smarter than me. 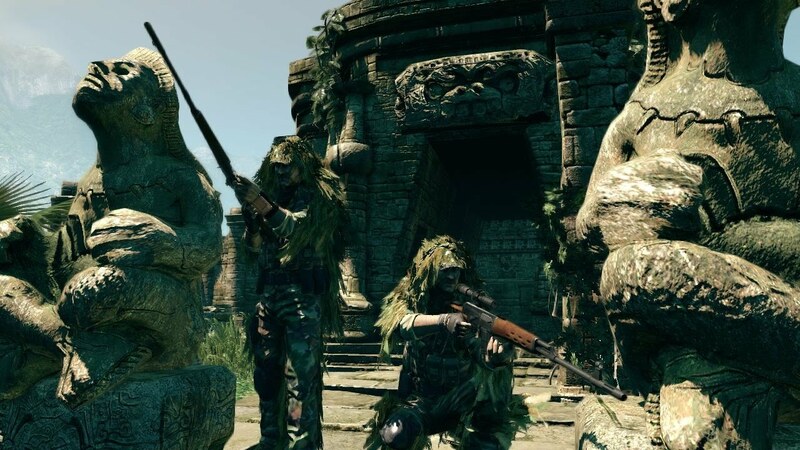 At certain points in the game I would retry a mission over and over again because I was so easily detected lying down in tall bush by a militia across the playing field. The recent patch did reduce the amount of times in which I would be detected but even when playing on easy, it is rather difficult at times as once you are detected, depending on the amount of enemies on the field, it is most likely lights out! I was also expecting my spotter to be a little more supportive especially in those said situations where my cover was blown, left me hoping he would save the day and try to provide some cover fire as I am running and screaming across the map like a kid being chased by a schoolyard bully. Lastly, I thought the assault scenarios where adding some weapon variety and run and gun team based warfare would have been a more fulfilling break from the stealth like gameplay, but it always felt a bit out of place. Overall, I had a lot of fun with Sniper: GW and will continue playing online as it felt a lot more tactful from start to finish than other titles in the same genre. It’s non linearity in additional to having to use a lot more thought before you take your shots was a nice change from the fast paced, unloading your clip on anything that moves as you sprint across the middle of a warzone. 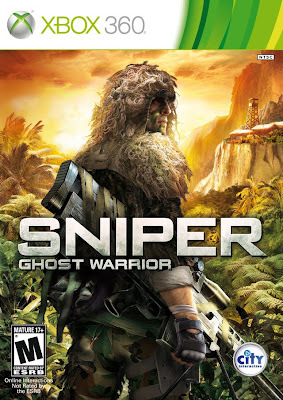 The story is good, keeping me engaged from start to finish and even though the single player missions do not have much in the replay department, it is a great way to hone your skills before getting sucked into the multiplayer side of the game, and with a price tag of $39.99, first person shooter and sniper fans alike are sure to enjoy. Sniper: Ghost Warrior is available now on the Xbox 360 and PC.